Stalker was originally the protagonist of an eponymous DC Comics book launched in 1975. This comic was part of the DC Implosion era. Like most such books it was abruptly cancelled for lack of success. 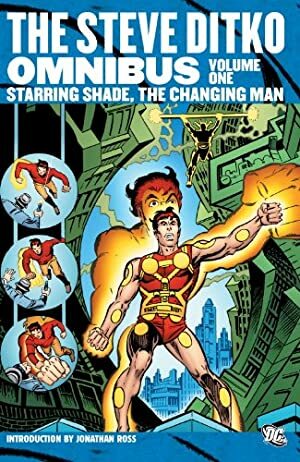 Stalker was actually pretty good, and the creation of three major authors of that time – Paul Levitz , Steve Ditko and Wally Wood . Like several DC Implosion books, it had a distinctly Moorcockian influence. 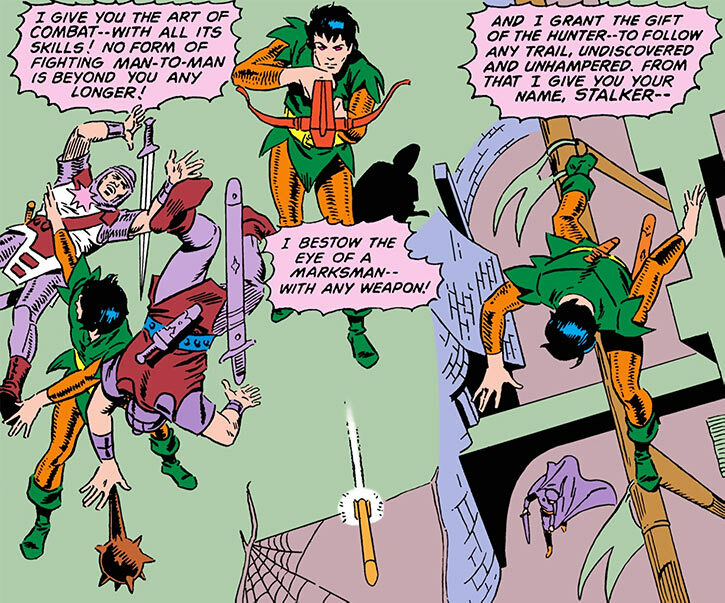 Stalker would return to DC Comics stories decades later, particularly in the wonderful Ends of the Earth Wonder Woman story. Base Of Operations: Mobile throughout his dismal world – and later throughout many worlds. Height: 5’8” (in 1945, about 6’5”). Weight: 146 lbs. (in 1945, about 300 lbs.). Eyes: Solid crimson (no pupils or irises) ; originally dark. Hair: Black. Stalker’s world is flat, with the seas cascading off the edges. Somehow it seems to have normal Earth gravity, atmosphere, etc. Two moons are visible in the sky. The place has a general worn, dour, impoverished, grim dying quality to it. Its main population looks human. This world has thousands of gods, who draw power from their worshippers ; the most prominent is the Devil-like Dgrth, god of war, evil and lies. These gods seem to be primarily physical beings, like the Asgardians in the Marvel Universe. This world was originally colonised by spacefaring humans, with vacuum suits and lasers. Their technology eventually collapsed, which seems linked to the arrival of a second wave of space travellers. These invaders reduced the humans to slavery, but the humans eventually revolted and locked their masters away in what seems to be a system of prison dimensions. It is implied that the alien invaders and the gods are one and the same. A likely chain of events is that when the invaders arrived, they somehow altered local reality to make the world magical and deprive the human colonists of their technology by changing physical laws. Even after the great rebellion, renegade humans continued worshipping the imprisoned gods in return for magic and power. This gradually became accepted practice, even though people were still celebrating their rebellion. This setting may be linked to the Fifteen Worlds cosmology. Stalker’s abilities are not superhuman, but in a setting not used to high-cinematic or super-heroic fighters they may appear so. He can still be defeated by ordinary opponents — for instance an entire group of determined men-at-arms — but very few people on his world can fight like he does. Stalker ignores fear and fatigue, and possesses formidable strength, willpower and speed. He does not seem to really feel cold weather, and can operate without appropriate clothing in the middle of winter. Our game stats assume that when he operates in a more high-powered milieu, Stalker “scales up” to remain at the top of the pecking order — that’s how his gift seems to work. Stalker can pick up improvised weapons (large bones, torches and the like) and fight just as efficiently as he would with real weapons. He also has an uncanny ability to fight opponents on his flank or even in his back without even looking at them. Stalker excels at using his environment as a weapon, and will often come up with unorthodox tactics. 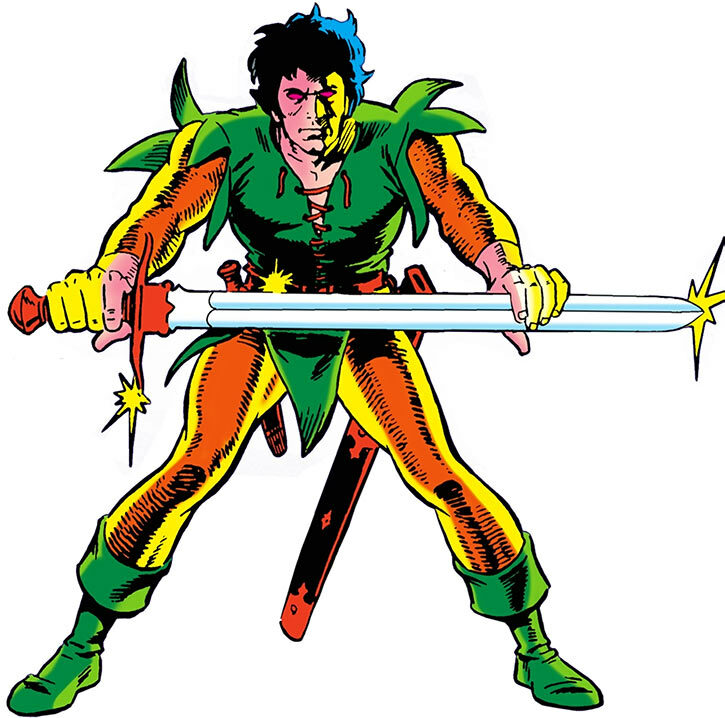 He can wield two-handed weapons (such as a quarterstaff) with but one hand. Though he was never seen dual-wielding two-handed weapons, a broadsword and a quarterstaff is a cromulent dual-wielding combination as far as Stalker is concerned. Beware the man with no soul ! Stalker no longer has a soul, and is thus beyond feelings, morals or emotions. He may not feel pain, and one gets the impression that he’s unageing and possibly unkillable. Stalker also knows a magical technique to cannibalise the puissance of mystics, demons and the like whom he defeats – making himself more powerful in the process. 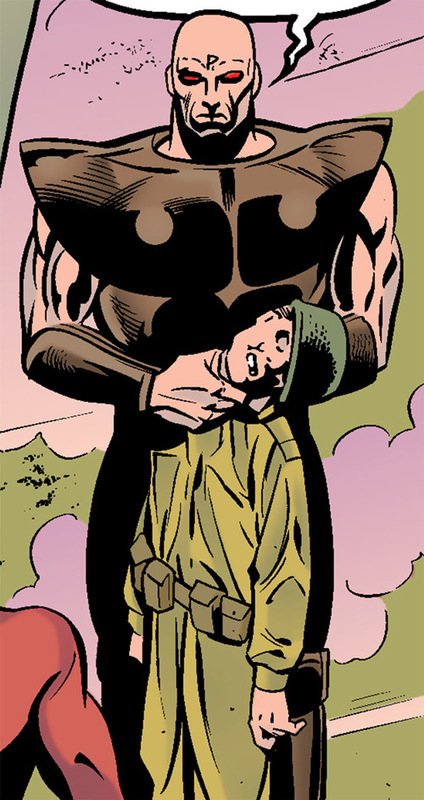 Thanks to this ability, in 1945, Stalker had grown powerful enough to withstand the combined assaults of the Justice Society (including Green Lantern (Alan Scott), the Flash (Jay Garrick) or Johnny Thunder’s Thunderbolt) — though that was a close thing and left him exhausted and forced to retreat. In 1945, Stalker chiefly his great magical power to project eldritch blasts from his hands, teleport and raise hordes of undead fighters – or single super-powerful zombies. He could also summon a whole fortified manor in the style of his homeworld, and had great (“Class 50”) superhuman strength. He was also nearly invulnerable. Direct contact with Stalker’s psyche produces an effect that Wonder Woman called the “black horizon”. It induces a numbing feeling of existential cold, a deep spiritual shock, and starts warping one’s mentality by dredging up a desire for cold, unfeeling violence and expediency. In 1945, this effect was strong enough to turn the mystic members and allies of the JSA into ranting, traumatised ghosts – an effect even Doctor Fate wearing his helmet could not resist. Spirits in Stalker’s presence will also suffer from this, albeit at a weaker level. This was only a thing at his 1945 power level. 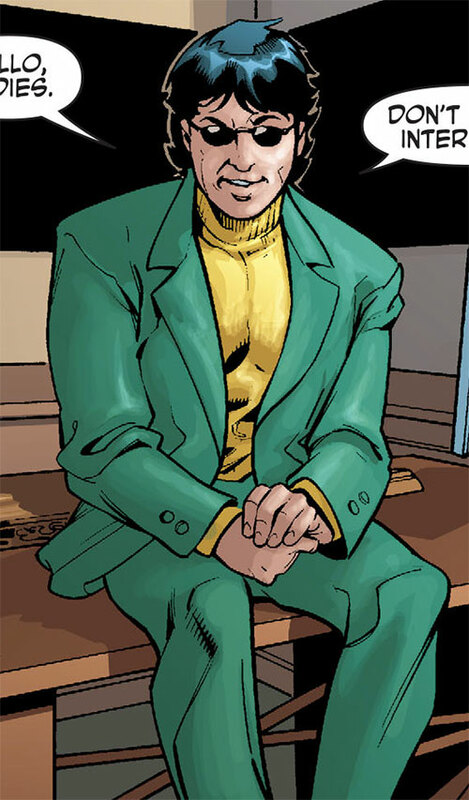 Stalker not having a soul is consistently treated as something far more terrible and horrifying than for other soul-deprived characters in the DCU, such as the magician Faust. For most such characters the lack of a soul is almost a technicality ; in the case of Stalker it horrifies even powerful mystical beings. 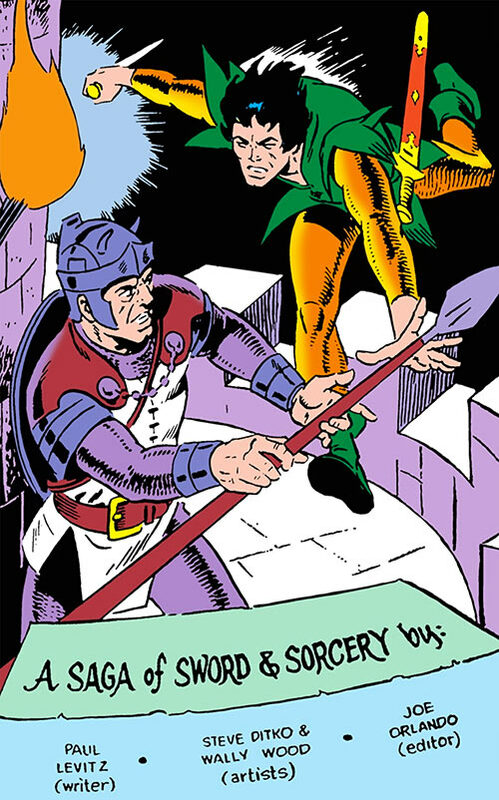 If a Player Character comes in contact with Stalker’s soulless psyche, treat it as a role-playing experience rather than with dice rolls – the effect is powerful enough to threaten major players such as Doctor Fate, Wonder Woman or the Spectre as he was in 1945, and such an AV/OV would blow most PCs out of the water nigh-instantly. The effect seems far more dependent on the values held by the person. Those who truly believe in compassion, altruism and empathy can resist the void in lieu of Stalker’s soul ; those who accept expediency, remorselessness and brutality will presumably soon succumb to the black horizon. In his 2008 appearance, Stalker wears a pendant with a stone that is reportedly the core of the Rock of Eternity. It was given to him by the mad sorceress Oracle. Stalker used this stone for interdimensional (and possibly chronal) travel, the creation of setting-appropriate garb and — apparently — teleportation. It also likely helped everyone understand each other. If this stone is what it was purported to be, it is presumably immensely powerful in the right hands. As a young boy, the future Stalker was thrown out of his home and left to survive in the town of Geranth, near a desert called the Cold Wastes. As yet another street urchin in a brutal, impoverished world, he had to fight for every morsel during his entire childhood, and to steal anything that he wanted for himself. For a while he criss-crossed the Cold Wastes, following merchant caravans and living off their refuses. Often dreaming that he was a great knight and an heroic fighter, the famished urchin kept looking for a way out. Eventually, he did the unthinkable and threw himself in front of the cruel baroness ruling the city of Loranth, asking of her to be taken in to train as a soldier, a man-at-arm and eventually a champion. Amused, the baroness had the boy become an expendable and underfed menial servant. After a year, the angry boy confronted her, only to be beaten up by her guards. However, he managed a daring escape and eventually made his way back to the Cold Wastes and Geranth. There, the nameless scapegrace visited the temple of evil and war, where men worshipped the terrible Dgrth. Amazingly, Dgrth manifested and offered peerless martial and hunting skills in exchange for the young man’s soul. The unnamed rascal eagerly agreed to the Faustian deal, and Dgrth called him Stalker. Beware the man with the stolen soul ! Stalker returned to Loranth, broke into the castle, killed interfering guards and hurled a note tied to a dagger next to the baroness’ head. It announced Stalker would be back to kill her a year hence, so she would live in dread of the return of the unstoppable killer. However, as he left, Stalker realised that he was drawing no satisfaction from this – Dgrth had already taken his soul, whereas Stalker had mistakenly assumed that it would take place upon his death. Stalker rode back to the temple in Geranth, killing the high priest when he realised that the man could not reach Dgrth for him. Claiming that the evil god had tricked him, Stalker set out to find Dgrth and reclaim his soul – and his ability to feel emotions. He eventually learned that there was but one man who knew of a way to reach Dgrth. This senior priest was called Prior F’lan and officiated in a temple on the edge of the world — where the sea falls away into eternity. Stalker simply went there and demanded to see Dgrth, but was captured. Annoyed, F’lan denounced Stalker as an envoy from a rival death god, to be sacrificed to Dgrth. However, a slave girl sympathetic to Stalker’s plight slipped him his dagger back. The soulless man waited for the sacrifice, hoping that Dgrth would be summoned in by F’lan. Darkling death at World’s End Sea ! As it turned out, the ceremony did not include a summoning. Stalker escaped and doubled back, rescuing the slave girl and forcing F’lan to tell him where the gate to hell was. Stalker then sailed to the Burning Isle – a patch of ice and tundra dominated by an active volcano and littered with ancient ruins. After several clashes with the guardian god of the isle, Stalker realised that the ruins where the very spot where the human uprising had banished the gods/aliens centuries ago. Entering a transdimensional door, he descended into Dgrth’s Hell. There, Stalker overcame a number of opponents and ritualised tests to get to meet Dgrth. However, once in his presence, Stalker turned back – to go face the hordes of warriors who had been consigned to Dgrth’s hell throughout the centuries. 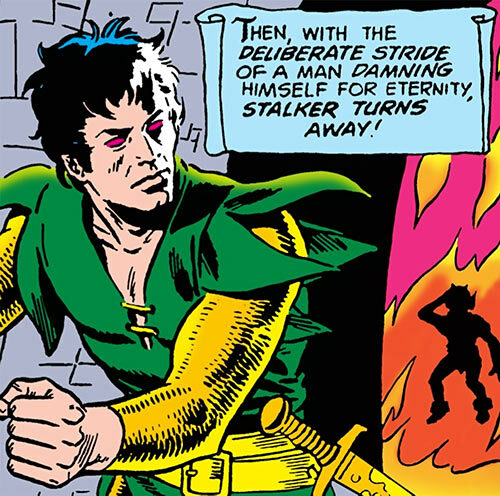 As the only living man in hell, Stalker was acclaimed as their champion by the damned warriors, and they offered to follow his lead. Soon Stalker, riding a hell-horse, led the vengeful warrior ghosts against the demons summoned by Dgrth. Leading from the front lines, Stalker broke into Dgrth’s stronghold, denouncing their deal and demanding his soul back. Dgrth told him that his soul was now irretrievably a part of himself and would remain so as long as he lived. 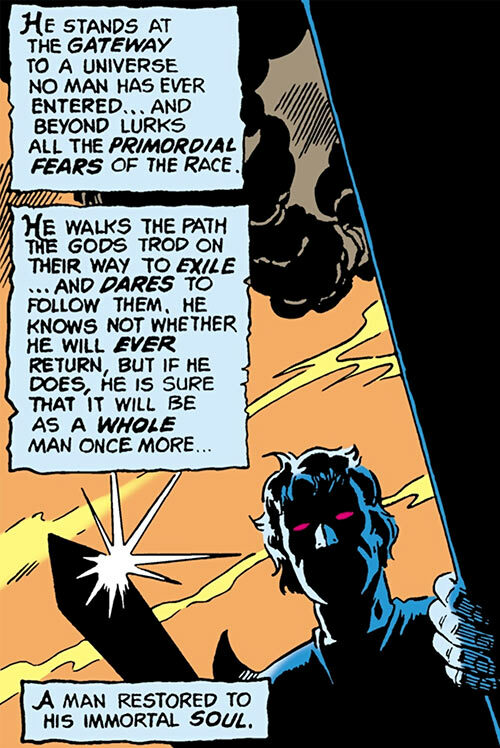 Furthermore, Dgrth’s nature meant that he would endure as long as evil and war did – the belief of mortals in an entity governing those making Dgrth eternal. As he left Hell, Stalker swore that he would expunge evil and war from the world, thus killing Dgrth. His further adventures are mostly unchronicled, but Stalker said that he left an interminable trail of death and destruction wherever he want, and that his passage always brought anguish and regret. To his soulless eyes, his ends were worth any means. Stalker apparently spent 300 years on his impossible quest, before cracking and going for the obvious solution – exterminating all life. Having learned to absorb mystical might from those whom he killed, Stalker started slaying mystics and gods to gain the power to murder everyone. After untold carnage none was left, but Stalker then realised that Dgrth had worshippers on other worlds – and that he had to kill those too. How long this went on is unknown, but Stalker killed untold millions. He became such a multiversal menace that several realities made preparations against him. 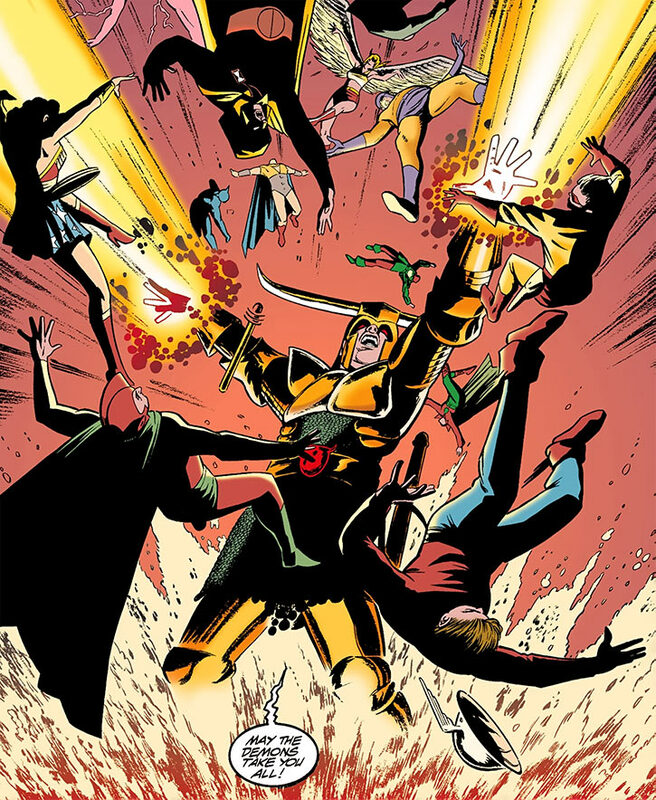 On New Earth it was Hourman, an android from the far future, who travelled back to the early XXth century to give a hourglass to a boy named Rex Tyler. 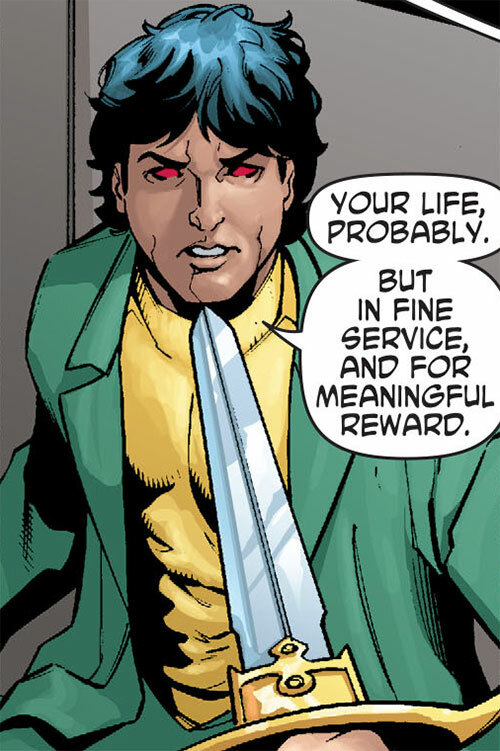 This was secretely a weapon against Stalker, and Tyler wore it as a symbol as he became Hourman. In 1945, Nazi occultist Richard Jensen attempted to summon the demon Koth in the US. The ritual called for immense energy, but also described a trap for powerful beings from whom to drain this energy. 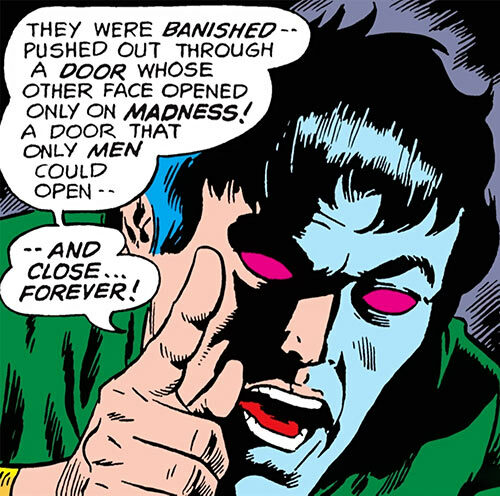 Jensen set up this trap and felled no less than the Spectre, Doctor Fate, Sargon the Sorcerer, Zatara, Merlin the Magician, Tor the Magic Master and their ally Hourman. He then drew their energy to open the portal. However, the ritual was itself a trap, and it was Stalker who came in and killed the Nazi cultists. Drawing energy from the defeated mystics, Stalker clashed with the rest of the Justice Society in Washington, D.C.. They barely forced him to retreat. Stalker also sent a magically-enhanced undead servant to absorb the stocks of fissionable materials at Los Alamos and turn them into a WMD. This atomic zombie was narrowly destroyed by Starman and the Atom. Leaving to recover in Antarctica, Stalker conjured undead servants and a fortified manor, then started building his usual world-destroying weapon. This paranormal contraption would gather the energy of the Earth and shoot it into the Sun, forcing it to go nova. The Justice Society assembled ! The JSA rallied, summoned its reservists and again attempted to take out Stalker. During the assault, Mr. Terrific identified the device that Stalker was assembling to destroy the solar system and sabotaged it. Doctor Occult then projected his own soul into Stalker’s psyche. This permanently damaged Occult, but having a soul within deprived Stalker of his insanity and freed the mystics who had fallen to Jensen’s trap. 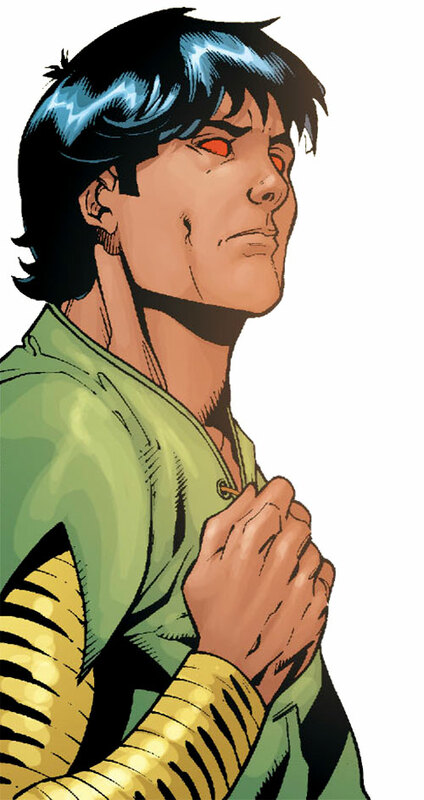 The freed Doctor Fate divined the importance of Hourman’s hourglass pendant, and instructed him to use it against Stalker. The hourglass catapulted Stalker into the past, right before he would lose his soul to Dgrth. Stalker was presumably now caught into a time loop, though each iteration of his life may have been slightly different. 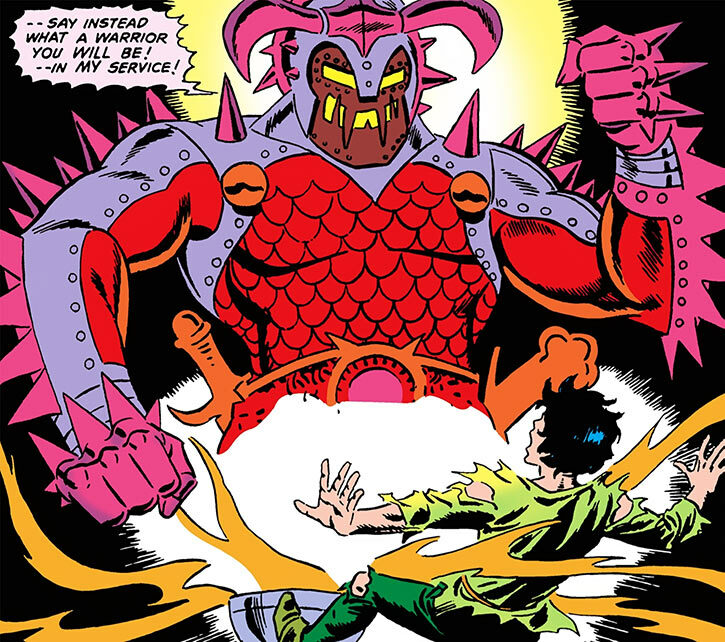 His next appearance in the DC universe may have occurred during a subsequent “rerun” of his life, early during the three centuries during which he uselessly quested to destroy the god of war and evil. Or perhaps that, from Stalker’s point of view, it took place centuries if not millennia before the clash with the Justice Society on 1945, during the first iteration of his life. When Stalker returned to the DC Universe, he had just met a sorceress called Oracle, who had sacrificed her legs and sanity to Dgrth to gain mystical gifts. She told him that Dgrth had lied, and was killable under exacting circumstances. Dgrth would die if sacrificed in a certain manner on a certain altar on the edge of the world, after three specific swordbearers of legend slew him. Wanting Stalker to kill Dgrth, Oracle also gave him a fragment of the Rock of Eternity to find the three fighters. 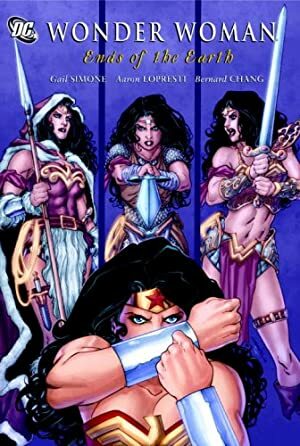 With the spells Oracle cast on the rock fragment, the greatest of the four fighters — Diana of Themyscira — would acquire the key assets of her three companions – Stalker’s soulless ruthlessness, Claw the Unconquered’s savagery and Beowulf’s nobility. Thus charged and as a symbol of peace, goodness and truth Wonder Woman would kill the god of war, evil and lies. Stalker reached Wonder Woman in 2008 and tricked her into using her Lasso of Truth on him, thus exposing her to the Dark Horizon. They then recruited their company by jumping from world to world. As they neared the final showdown, Wonder Woman used her royal prerogative to name Stalker – she called him “Elpis” (meaning “Hope”). This was the first time Stalker ever had a proper name. However, it was all a trap. 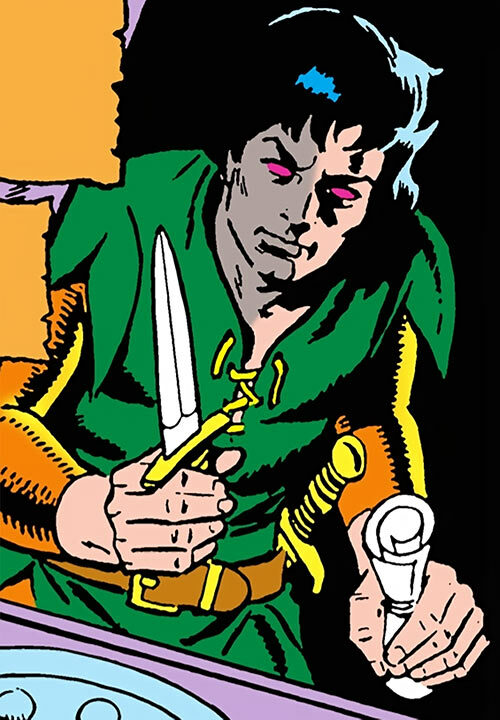 The desperate Stalker was a double agent for Dgrth, who had offered to give him back his soul if the led the three swordbearers to their death. As they were about to confront Dgrth, Stalker threw his sword at Wonder Woman, wounding Beowulf who interposed himself. Feeling that his soul was back, Stalker exulted – then realised that Wonder Woman had cleverly grabbed his fragment of the Rock of Eternity while he was distracted. Diana used the Rock to cast herself and Dgrth on New Earth, where she had her full Wonder Woman powers. She shook off the Dark Horizon to reclaim her sense of compassion, thus regaining her use of her Lasso of Truth and vanquishing Dgrth. 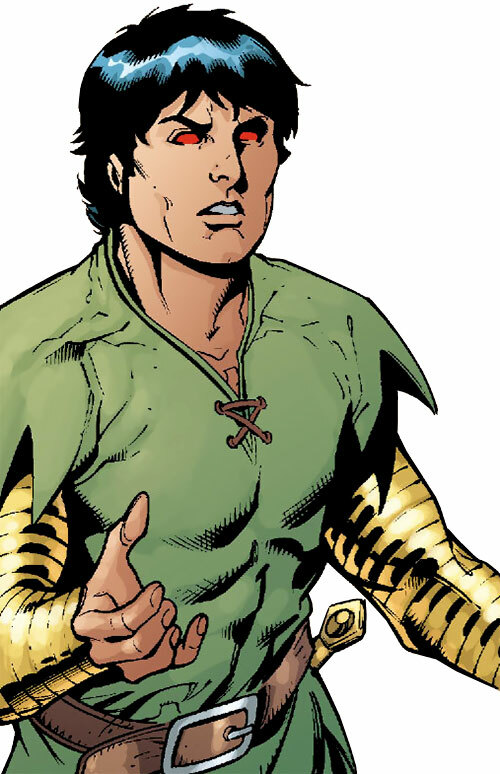 Meanwhile, Beowulf and Oracle apparently convinced Stalker to renounce his alliance with Dgrth now that he had a soul. 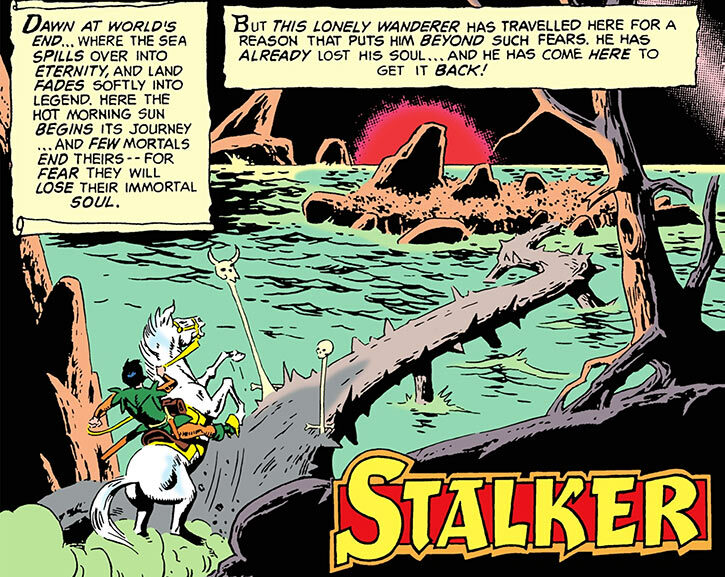 Returning with the still-living head of Dgrth, Diana told Stalker that the soul within him was hers – the god of war and evil had used it to fool Stalker after Wonder Woman’s soul was displaced by the Dark Horizon. Stalker’s real soul was, as Dgrth had said, lost. Dgrth was ritually slain, and Diana reclaimed her soul, leaving Stalker with nothing. Crushed, Stalker left with Oracle, as the pair intended to find some way to undo their pact with the dead god. Stalker was bigger and more powerfully-built in 1945, likely as a side effect from all the absorbed energy. A cold, emotionless hardarse and swords-and-sorcery adventurer. He’s dual-classed as a fighter and a rogue, as it were (Fighter 12/Rogue 6 or some such), and in his adventures will use both his superior martial skills and his gift for stealth, tracking and infiltration. Stalker is genuinely fearless and extremely confident in his skills. He has been known to employ approaches that would be unreasonable for a lesser man, such as demanding cooperation from a roomful of bloodthirsty and armed worshippers of death. His approach will usually be blunt and straightforward, and he treats most opponents as being more annoying than dangerous. As his inability to feel emotions diminishes his empathy, Stalker acts solipsistically. His early adventures were generally heroic, and he would rescue people and the like – but on some level he was just going through the motions and didn’t really care. Having been the underdog victimised by evil and powerful folks, and having always dreamt to be a shining knight, he did what he’d always wanted to do, but there was no satisfaction in it. His attitude after he rode in to save the day became closer to “okay, problem solved, now go away, thanks, bye”. If he fails or is forced to abandon those he was helping, he does not feel remorse or regret. As the years, then the decades went by, Stalker’s soulless nature and all-consuming determination to recover his soul burned away these remains of a moral sense. He knows of no love, no joy, forever and ever until he becomes unable to relate to human beings, which eventually will lead him to genocidal detachment. Thus, in 1945 Stalker was obsessed with bringing annihilation to the entirety of creation – even if he had to do it one person at a time. He did not consider that a good thing, but felt compelled to perform his grisly task as it was the only way for him to ever know peace from his eternal torment. Cold Immunity is Form Function. “Emotion immunity” boosts his RV against effects relying on emotional manipulation – chiefly Broadcast Empath, Phobia and Aura of Fear, but possibly some other effects and modes of Character Interaction (GM’s call). Full vision only works in combat, to deny positional or awareness advantages to fighters flanking or in the back of Stalker. Iron Nerves, Lightning Reflexes, Schtick (Contender, Make-do Equipment (Weaponry (Melee, Missile))), Misc. : Stalker does not have a soul, which may make him immune to some (usually mystical) abilities. Distinct Appearance (Crimson eyes, unsettling vibe caused by his soulless nature), SIA toward recovering his soul. Stalker’s usual kit is a Broadsword [BODY 06, EV 04 (05 w/STR, 07 w/Martial Artist)] and a Large Dagger [BODY 05, EV 04 (05 w/STR, 07 w/Martial Artist)]. He seems to be wearing light chainmail – though whether it actually has protective property was never clear. LIGHT CHAINMAIL [BODY 06, Skin armour: 01, Limitation: Skin armour only vs. bladed weapons]. Soul of the Rock of Eternity [BODY 30, Dimensional travel (Travel): 12, Sorcery: 12]. It is strongly implied, but never demonstrated that Stalker cannot die – he doesn’t have a soul that can leave his body. It is thus possible that he has about 15 APs of Always On Invulnerability with a Misc. Limitation that it takes several hours to kick in. 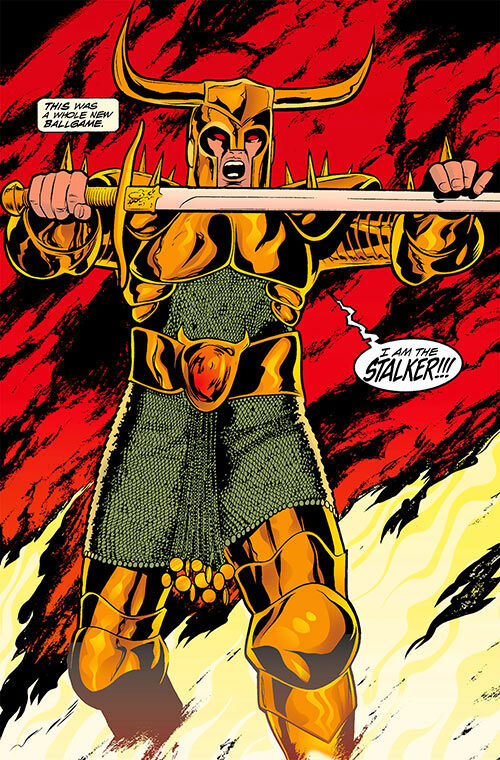 The version of Stalker that appeared on the DC Earth in 1945 wielded enough power to take on the entire Justice Society after he had absorbed the power of the Spectre, Doctor Fate and others. Here are some tentative stats for Stalker after the power absorption. His power level just before the absorption is unknown, but even then Stalker was powerful enough to ravage a world given enough time. Immortal, Iron Nerves, Lightning Reflexes, Schtick (Improvised weapons), Misc. : Stalker does not have a soul, which may make him immune to some (usually mystical) abilities. Distinct Appearance (Crimson eyes, unsettling vibe caused by his soulless nature), CIA toward the Nihilist Motivation, MPI. Stalker still uses a Broadsword [BODY 15, EV 04 (13 w/STR)] and a Large Dagger [BODY 15, EV 04 (13 w/STR)]. His ARMOUR is presumably magical [BODY 12, Skin armour: 02]. Stalker had the entire plans of his DOOMSDAY DEVICE memorised and could routinely use sorcery and undead servants to build one within hours. Mr. Terrific recognised it as a four-dimensional object transposed in normal space, based on Arthur Cayley’s fractional dimensions. Since Mr. Terrific knew exactly what the DEVICE was and how it worked, it is likely that Stalker was just using existing plans from mystical and/or weird science literature available in several dimensions. The DEVICE’s main function was to draw chthonian energy and shoot it into the sun, making it brighter and brighter until it went nova. The counterweight arcs of the extremity gears of the DEVICE were equipped with enormous blades, and reacted as a system of defence to cleave people attempting to monkey with it (AV 05, EV 10). Stalker did not seem to use many Rituals (he had full-blown Sorcery), but he was summoned by a ritual that included a mystical booby trap. This booby trap was powerful enough to fell Doctor Fate, the Spectre and other mystics. Treat as a Magic Blast: 30 (doing Bashing Damage) that is its own AV and has 5 APs of Area of Effect, but only affects people with Sorcery or Homo Magi. This trap allowed Stalker to step into our dimension and to reinforce his own might with the energy of those it had just felled. He also presumably used a mysterious Ritual with Animate Dead and Endow effects to create the Los Alamos Zombie (see below). During the centuries that follow the story in the 1970s Stalker book, Stalker learns a technique or Ritual that allows him to appropriate part of the puissance of the mystics, demons, godlings, etc. whom he defeats. This is how he eventually acquires the superhuman Powers, Attributes and Skills in the 1945 stats above. The campaign had special rules about Character Advancement, greatly increasing the costs for such. A factor of twenty over what is described in the rulesbook seems reasonable, given the dreary nature of the world and the fact that even the hero’s skills come from sudden divine empowerment, not training and development. Stalker somehow gained a campaign-specific Miscellaneous Advantage allowing him to use costs closer to baseline Character Advancement, but only with HPs gained by defeating opponents with magical abilities or a magical nature. He then takes centuries, and the death of innumerable foes, to reach his godlike power. This elite undead servant was created specifically to absorb stocks of U-235 used for atomic research at Los Alamos, and turn itself into a dirty bomb. 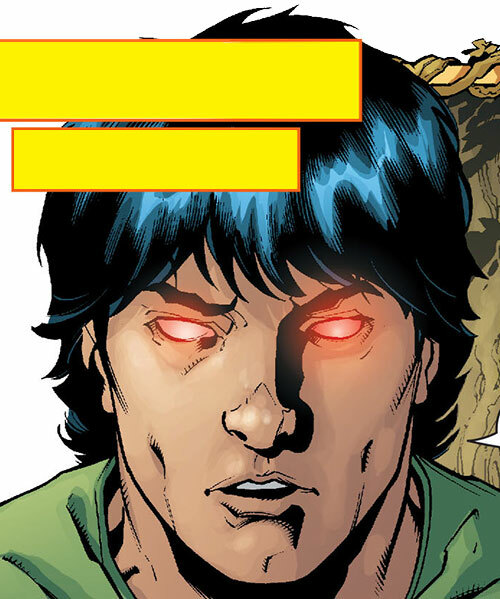 It called itself the Disciple, and may have been an unknown metahuman before his death. There isn’t enough material to hazard stats, but before absorbing the uranium it had control over winds (Weather Control: 09, limited to winds ?) and probably some minor level of superhuman strength/durability – plus perhaps flight. By surrounded itself with a raging sandstorm, it killed dozens of GIs. After absorbing the uranium, possible abilities included Flight: 11, DEX 05 STR 09 BODY 09, Energy blast: 12 (from the hands or the mouth). Its Weather Control was augmented (12 ? ), and the winds were now fiercely radioactive (Cell Rot: 04 attacking twice a minute, to keep it simple). The Disciple itself was as radioactive as these winds. Source of Character: DC Universe — primarily the 1975 Stalker comic book series (by no less than Paul Levitz, Steve Ditko and Wally Wood) plus Gail Simone’s excellent Ends of the Earth Wonder Woman story arc. Helper(s): Darci, Ethan Roe, Gareth Lewis.